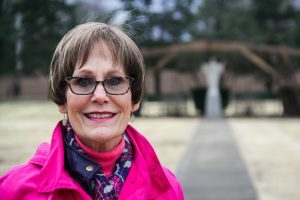 Alexandria, Va. – Sister Donna Markham OP, PhD, president and CEO of Catholic Charities USA (CCUSA), announced today that Ms. Jana Hukriede of Springfield, Missouri, has been named the CCUSA Volunteer of the Year for 2019 (Click here for a brief video featuring Hukriede). Hukriede started volunteering with Catholic Charities of Southern Missouri (CCSOMO) in May 2013. Since then, she has built and managed a gardening and harvesting operation that feeds expectant mothers at CCSOMO’s crisis maternity home, LifeHouse. In 2018, Hukriede oversaw the building of a greenhouse that allows the growing of vegetables year-round. She also grew her volunteer base from just a few fellow planters to more than 40 gardeners. Clearly, Hukriede possesses more than green thumbs; she’s a natural leader too. Like all clients whom CCSOMO serves, the women of LifeHouse are among the poor and vulnerable. Most of them grew up without the knowledge of a healthy diet or the joys of providing for oneself. Hukriede encourages the women to take a hands-on role in the gardening so that they receive not only nutritious food but also the confidence that comes with good work. CCSOMO hopes that the garden and the greenhouse will become a social enterprise for the clients. No doubt it will happen through the continued work of CCSOMO’s Volunteer of the Year, Jana Hukriede. The CCUSA Volunteer of the Year Award, given annually since 1998, is granted to an individual who embodies the mission of CCUSA to provide critical services to those in need, advocate for justice in social structures and call the entire Church and other people of good will to do the same. Catholic Charities agencies across the U.S. nominate candidates for the award from nearly 300,000 volunteers. Catholic Charities USA (CCUSA), a member of Caritas Internationalis, is the national office for the Catholic Charities ministry nationwide. CCUSA’s members provide help and create hope to more than 10 million people a year regardless of religious, social, or economic backgrounds.